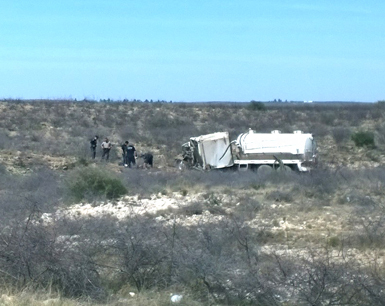 New Mexico State Police officers, Eddy County Sheriff’s Office deputies, and EMS crews from the Carlsbad Fire Department and Happy Valley Volunteer Fire Department respond to the scene of an accident that occurred just before 3 p.m. Wednesday on U.S. 285 north of Brantley Road. Preliminary evidence suggested the small tanker truck had a blowout while travelling south on 285. It veered through the median and across the northbound lanes before coming to rest approximately 50 yards from the roadway. No further details were available as of press time.